The Scoop: Five closely leveled players will be assigned to a court for 5 consecutive games. Each player keeps track of their own score however you don’t want to get points! You receive points from each unforced error you make. With each unforced error and point you will put on a bead necklace to wear! This is one time you don’t want to be the prettiest and most bejeweled player on the court! Make a winner that can’t be returned by Superman or Superwoman? 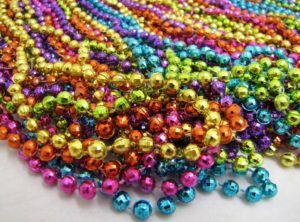 Take away one of your unforced error points and unload a bead necklace! Players with a bye will be bead (and unforced error) monitor of their court. Games will be timed.